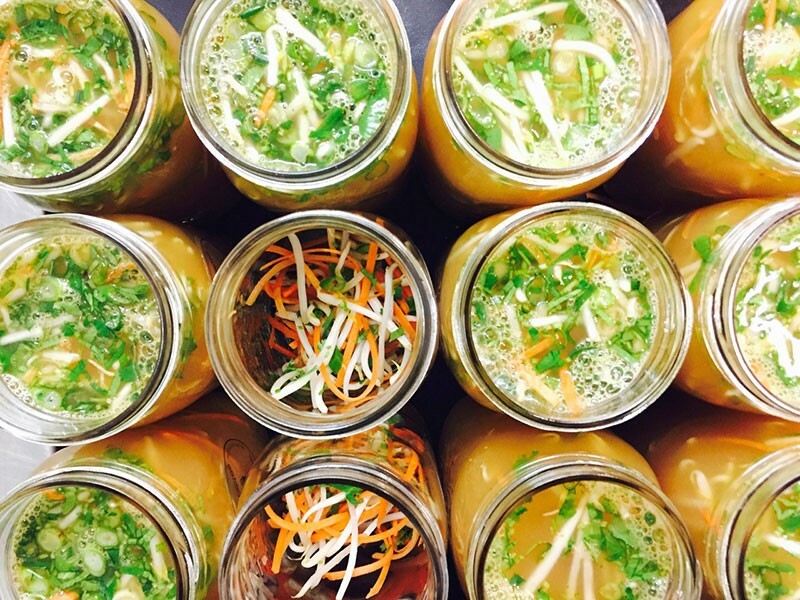 A NEW WAY TO GO Santa Rosa's Three Leaves' menu changes weekly and includes good stuff like noodle-soup-in-a-jar. Every year, Baum+Whiteman, a nationally renowned restaurant consulting firm in Brooklyn, issues its list of food trends. The No. 1 trend this year is "Amazoning and Uberizing" in the form of tech-driven, food-delivery services. Unlike pizza delivery, the food is meant to be high-quality and prepared with flair. The goal is to offer a gourmet experience, minus the restaurant wait list, or a hearty homemade meal you don't have to lift a finger to cook. During 2015, services like UberEATS and Blue Apron energized the niche, delivering restaurant dishes and prepared meals to homes everywhere in the country. San Francisco launched homegrown apps such as Sprig, a healthy lunch and dinner service, and Caviar, a restaurant delivery app. While these successful newcomers don't go beyond the Golden Gate Bridge, meal services have popped up in the North Bay too. In Santa Rosa, Three Leaves (threeleavesfoods.com) allows customers to pre-order a weekly or a monthly meal service online. Customers pick up their meals Wednesdays between 3pm and 6pm, and Thursdays from 11am to 2pm. The menu changes weekly and includes six items. For a one-time $25 member fee and $80 for six people or so, you've got dinner covered. Tiana Kraus, a nutritionist and certified baker of gluten-free goods, started the service over a year ago with her brother and chef, Jeff Nunes. "We see ourselves as a middle person between the farmers and the people searching for the food they wish they had time to make," Kraus says. Another Santa Rosa–based service is Vivace Gourmet Meals (707.570.6214), founded in 2013 by Ashley Rarick. Rarick, who educated herself on healthful cooking after suffering various health issues, creates "luxury meals using only organic ingredients" delivered to clients' homes twice a week. She tailors her menus to a customer's needs, "whether it be an allergy, preference or goals like weight loss or weight gain, alkaline diets, paleo—you name it." "I think organic meal delivery has become popular because people are realizing what's in their food and are focusing on their health, not to mention how convenient it is to have customized meals made for you and delivered to your door," Rarick says. The service costs about $54 a day, per person, which includes an all-organic lunch and dinner, with snacks as an additional option. There is a $10 fee for Sonoma County deliveries. Deliveries are on Tuesdays and Fridays. Ruthy's Real Meals (ruthysrealmeals.com), based in Cotati, offers Tuesday deliveries just in time for that midweek fatigue. Packed in sturdy microwave and oven-safe containers, dishes include honey miso glazed fish and pineapple brown rice. Special-occasion menus are available too. (On Valentine's Day, Ruthy's featured a holiday brunch menu.) Prices vary from $10 for a single serving of a side dish to $50 for three to four servings of an entrée. Delivery is free with orders of $75 and up—easily achievable if you order a large family meal. Sonoma has its own luxury meal delivery service, Sonoma Meals (sonomameals.com). A new menu is posted on the company's website each week. Deliveries are made on Tuesdays. Prices range from $6 for a small dessert to $45 for a large entrée. Rather surprising for Sonoma's humble size, there's also Sonoma Food Taxi (sonomafoodtaxi.com), a delivery service that contracts with six local restaurants, including Taste of Himalayas, Maya and the Red Grape. The service offers full menus and options to order from a number of restaurants on the same ticket. In Marin County, a very different service, a local Blue Apron of sorts, caters to busy families. Pernilla Sumner started Pernilla's Pantry (pernillaspantry.com), which delivers anywhere from Sausalito to Novato, in 2013. "I worked long hours for many years having small children, and the only way I would be able to get healthy, home-cooked meals on the table was to plan ahead," Sumner says. "On one of my trips to my home country of Sweden, I discovered that meal-kit deliveries had been a fast growing market for a few years." Unlike other services in the area, Sumner supplies kits with ready-to-go ingredients and recipes, meant to be assembled and cooked quickly without the need for slicing and dicing. Prices start at $8 per meal and can grow according to clients' needs. "We're definitely a part of the delivery craze," Sumner says. "People in our area really appreciate locally grown and sourced products, and are looking for easy ways to eat healthy. That's where we come in." While some of the services have online ordering available, others require a phone call, which might be not very 2016, but it's much more personable. Without sophisticated apps or slick branding, these local ventures offer the best of both worlds, all the perks of food "Uberizing" without the anonymous, corporate aftertaste that usually comes with it.